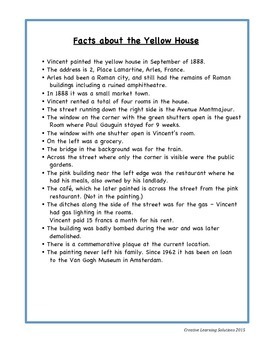 In this fun activity students will analyze and compare famous paintings depicting common aspects of daily life in different time periods. 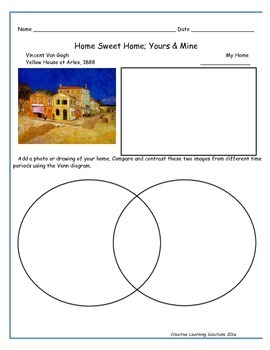 In this activity student will compare Van Gogh's "Yellow House at Arles" with their own home. 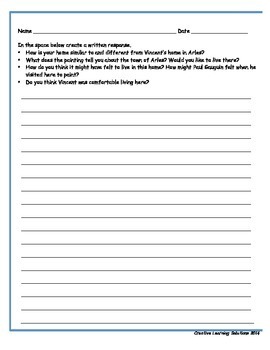 Students then use their graphic organizer to write a short personal response essay. 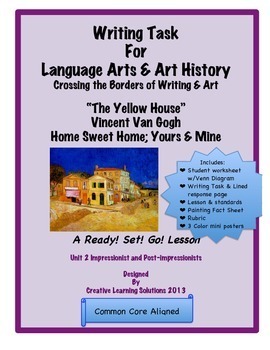 Part of the "Crossing the Borders" Series; this lesson is common core aligned and supports the visual arts and language arts standards. Worksheets, diagrams, color mini prints and a rubric are included. This lesson supports the language arts curriculum, and addresses writing activities for state testing. After a discussion, students will organize their comparison using a Venn diagram and create a written response to an open-ended (constructed response) task with 3 bullets.